Charming Doodle...sew it, build it! : What Christmas Decorations?? If you have knew me very well "before" the house water-damage-fixing-craziness...you know that one of my favorite things was decorating my house for Christmas. I'm the odd one who owned 4 Christmas trees...bin after bin after bin full of decorations...and anything I could get my hands on that was peppermint-scented! Last year we were living in our rental house while renovating our house and we didn't set up a single decoration. This year, even though we're back in our house...it's not looking good in the Christmas decorating department. Nevertheless...the festive atmosphere hit our house for a small time today...craft day with the kids! While at my parents' for Thanksgiving I raided my mom's Woman's Day magazine and tore out 4 or 5 pages of wreath-making ideas. The one we made today was the one from the cover and we'll be making several of the others this weekend. 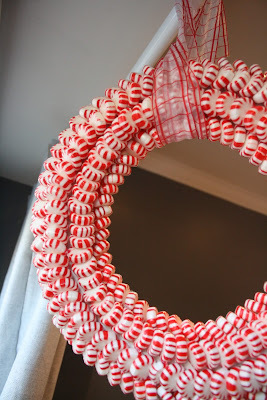 The kids helped unwrap over 3 bags of peppermint candies while I was hastily hot-gluing them onto a wreath form. We love how it turned out! Have you made anything fun to decorate your home for Christmas? 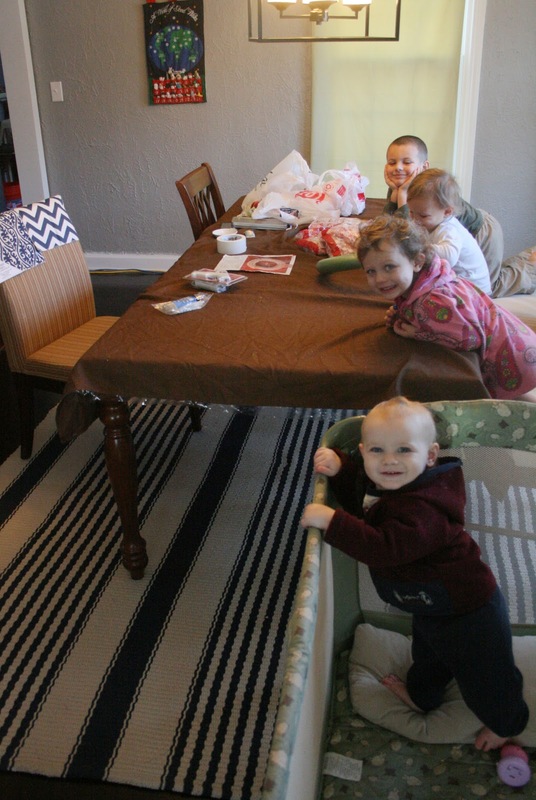 *Please excuse the odd-looking dining room. It's still a work in progress. Our new dining table gets delivered next week (YAY! ), and I have lots of curtains and chair covers to make so we can finally stop using ugly green shower curtain liners as our curtains. :) Soon I'll post more pics of the room since it's been greatly neglected on this blog so far.